Bring us the head of Stephen Elop! Yesterday, we learned that some Nokia investors -- for years, a group largely composed of US banks and hedge funds -- are feeling grumpy. Apparently, they no longer believe the hopeful talk of fanboys and analysts (like this one) who say the phone maker's share-price will recover, 'soon'. So, these investors have filed suit against Nokia and CEO Stephen Elop. Some people just have no faith, I guess. The complaint alleges that during the Class Period, defendants told investors that Nokia’s conversion to a Windows platform would halt its deteriorating position in the smartphone market. It did not. This became apparent on April 11, 2012, when Nokia disclosed that its first quarter performance would be worse than expected. Nokia expected its first quarter 2012 non-IFRS Devices & Services operating margin to fall by 3%, and projected first quarter 2012 Devices & Services net sales of €4.2 billion. It also disclosed a glitch in its newest Windows offering – the Lumia 900. Nokia had to immediately offer customers an automatic $100, making the phone essentially free. As a result of this disclosure, the price of Nokia’s American Depositary Shares (“ADRs”) dropped over 16% in a single day. Plaintiff seeks to recover damages on behalf of all purchasers of Nokia publicly traded securities during the Class Period (the “Class”). The plaintiff is represented by Robbins Geller, which has expertise in prosecuting investor class actions and extensive experience in actions involving financial fraud. We think there's a lesson, here. And that is, no matter how many times a CEO gives a rousing, FDR-type speech with evocative themes like 'burning platform' and regardless of his charming rapport with interviewers, none of that helps if the share price falls to a 15-year low. Or if the company starts losing a billion dollars every quarter. And if the shareholders' aren't angry yet, tell them the company's bonds were downgraded to junk. 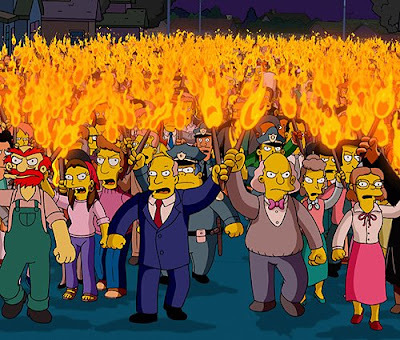 Such finger-pointing may seem unfair, harsh or even a bit bourgeois to folks like Mr. Elop and his extraordinarily patient enablers supporters on Nokia's board. But it's human nature to react emotionally in some circumstances, especially where money's involved. Fortunately for Mr. Elop et al, their jobs will likely be saved by another aspect of human nature: when people get upset, they lose track of details. Details like this illustration (below). 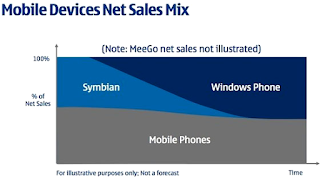 Included with the transcript for Mr. Elop's (in)famous talk during Nokia's Capital Markets Day, 11 Feb., 2011, the chart -- "Mobile Devices Net Sales Mix" -- shows how Nokia imagined Windows Phone would supplant Symbian, as the latter OS is slowly moved from what Elop called their 'franchise platform' to a 'legacy platform'...ie: as Symbian is made obsolete. Criticism of this phased replacement plan seems key to the shareholder's case. Basically, they allege that Mr. Elop & Co. mislead them by promising, "Windows platform would halt [Nokia's] deteriorating position in the smartphone market." Tho' MobilePhonesFan is no lawyer, we see two small, but obvious problems with that claim. And if you closely examine this chart, you'll see them, too. For one thing, this chart provides no time-scale for the y-axis. How long will it take for new WIndows Phone revenues to make up for lost Symbian sales? Maybe that's still a few years down the road. In fact, CEO Elop has mentioned 2016 as the likely end-point for Symbian. Second...well, click to a larger version of the chart, then look carefully at the words beneath, over on the left-hand side. "For illustrative purposes only; Not a forecast."